Build-A-Bash 2019 Fundraising Campaign for Habitat for Humanity of Schenectady County, Inc.
Build-A-Bash will celebrate it’s 7th anniversary on Thursday, September 26th at the Schenectady Armory Center at 6pm. It will be another incredible evening of fun and thrills. The screams, shouts and applause will boom throughout the Armory as our contestants compete for the 2019 Trophy in the infamous Tug of War Challenge. You can watch or join in the Hammerschlagen contests, going shoulder to shoulder with others. Jack Aernecke will be the Master of Ceremonies. The Major Food Sponsor is Mallozzi's, without a doubt you will enjoy delectable cuisine with a cash bar. Making the Build-A-Bash even more extraordinary, Wolf Hollow Brewing Company will be the official Brew Sponsor of the 2019 Bash. But there is more.....Wolf Hollow will release a new brew at the event - a BASH BREW! Come - enjoy - and be part of the Wolf Hollow Brewing Company exclusive release. Back by fearless demand, there will be a scream raising extreme LEAP OF FAITH from from the rafters offered by Mountain Ridge Adventure. With your feet on the ground you can play Wild Sports Stackers XL Game, Bounce in the Trustco Bank Fun Zone and much more! Come join us and Play it Forward as we raise funds for affordable housing, RAMP UP, The Veteran's Build and our Family Service Programs for the hard-working families of Schenectady County. Entry into the Bash, including many culinary delights by Mallozzi's, a cash bar with the exclusive release of Wolf Hollow Brewing Company's Bash Brew, a LEAP OF FAITH from the Rafters by Mountain Ridge Adventures, Hammerschlagen, cheer the Tug Teams onto victory, a Bounce Zone and MORE! Private VIP Champagne Reception with a Complimentary WOLF HOLLOW BREWING COMPANY TASTING of the exclusive release of the BASH BREW. Entry into the Bash, including many culinary delights by Mallozzi's, a cash bar with the Wolf Hollow Bash Brewing Company, a LEAP OF FAITH from the Rafters by Mountain Ridge Adventures, Hammerschlagen, cheer the Tug Teams onto victory, a Bounce Zone and MORE! 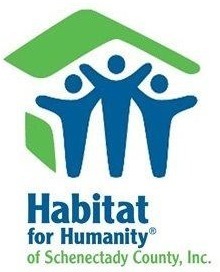 Event to Support Habitat for Humanity of Schenectady County, Inc.